A device that could reduce key health risks facing kidney-failure patients who are connected to dialysis machines has won a $10,000 first prize for Johns Hopkins graduate students in the 2011 ASME Innovation Showcase. The competition, involving 10 collegiate teams, was conducted earlier this month in Texas at the annual meeting of the ASME, founded in 1880 as American Society of Mechanical Engineers. Judges based their awards on technical ingenuity, quality of business plans, potential for success in the marketplace and other factors. The top prize went to the Hemova Port, a device designed to be implanted beneath the skin in a leg, allowing a kidney-failure patient to receive blood-cleansing dialysis treatment with reduced risk of infection, clotting and narrowing of the blood vessels – the three most common problems linked to existing connection techniques. The prototype has not yet been used in human patients, but testing in animals has begun. This device was developed by five Johns Hopkins biomedical engineering students enrolled in a one-year master’s degree program in the university’s Center for Bioengineering Innovation & Design: Sherri Hall, Peter Li, Shishira Nagesh, Mary O’Grady and Thora Thorgilsdottir. The team members recently graduated, but Li has remained in Baltimore to form a company that will continue to test and develop the project. With help from the Johns Hopkins Technology Transfer staff, the team has filed for three provisional patents covering their technology. The patents list the five students and three of their medical faculty advisers as the inventors. In organizing the company, Li has been joined by Brandon Doan, who earned a Johns Hopkins undergraduate degree in biomedical engineering and is now enrolled in an engineering management master’s program. Doan represented Hemova in the ASME competition. Li and Doan will manage the company’s daily operations, while the other four students inventors will serve as consultants and could benefit financially if the project advances. The students learned about the need for such a device last year while accompanying physicians on hospital rounds as part of their academic program. They watched as one doctor performed a procedure to open a narrowed blood vessel at a kidney patient’s dialysis access site. They learned that this narrowing was a common complication facing kidney patients. The students discovered that kidney failure each year requires 1.5 million people globally and 350,000 in the United States alone to undergo regular hemodialysis to prevent a fatal buildup of toxins in the bloodstream. The students also learned that the three most common ways to connect the machine to a patient’s bloodstream work only for a limited time because of problems with infection, blood clots and narrowing of the blood vessels. According to the students’ business plan, these current dialysis access options are “grossly inadequate,” contributing to increased healthcare expenses and in some cases patient deaths. This illustration shows the Hermova Port attached to the femoral vein beneath the skin, where the student inventors say the risk of infection is reduced. To address these problems, the students developed an access port that can be implanted in the leg beneath the skin, reducing the risk of infection. The Hemova device is equipped with two valves that can be opened by the dialysis technician with a syringe from outside the skin. The technician can similarly close the valves when the procedure is over, an approach that helps avoid infection and clotting. The device also includes a simple cleaning system, serving as yet another way to deter infections. Currently, most dialysis access sites are in the arm or the heart. The Hemova device instead is sutured to the leg’s femoral vein, avoiding the unnaturally high blood flows that cause vessel narrowing when dialysis machines are connected to veins and arteries in the arm. 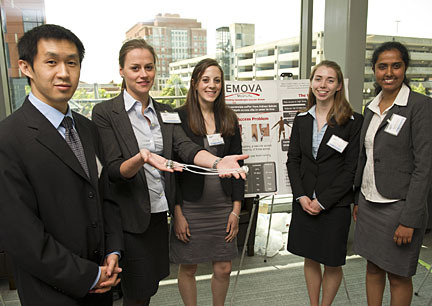 The student inventors say the Hemova Port’s leg connection should allow the site to remain in use for a significantly longer period of time. The Hemova team has applied for a $50,000 grant to conduct more animal testing in the coming months. Clinical trials involving human patients could begin as soon as 2013, the students said. The students’ clinical advisers were Johns Hopkins School of Medicine faculty members Thomas Reifsnyder, an assistant professor of surgery; and Kelvin Hong and Clifford R. Weiss, assistant professors of radiology. Their academic program adviser was Soumyadipta Acharya. Johns Hopkins University news releases can be found online at http://www.jhu.edu/news_info/news. Information on automatic e-mail delivery of science and medical news releases is available at the same address.